Upon seeing these correspondence notepads arrive in stock at Bookbinders several months ago, I had no hesitation in adding one to my shopping list for the next store visit. With my fondness for the Masuya paper in the Monokaki Notebook line well-known to readers here, it wasn’t a difficult decision to pick up another product containing that same paper stock. Of course there is always the possibility of slight differences in the feel of a paper when presented in a different format, and I wasn’t completely certain about the 12mm line spacing in relation to my writing style either. After finally visiting the store a few weeks ago (yes I could have bought them online — but what’s not to love about visiting an actual stationery store), as you can imagine — I needn’t have been concerned. In summary, this is your standard B5 sized notepad designed for use in written correspondence. Packaged in the commonly used cellophane clear wrap, that new stationery aroma hits you upon opening. I don’t think anyone would disagree that on first tactile impressions, the feel is one of a quality product. Visually, the overall aesthetic is one of elegance with a touch of the old school conservative about it — for want of a better term. I quite like the maroon (or burgundy I suppose) cover with white trim, though perhaps the gold embossed bordering around the branding may not have been necessary. The maroon and gold combination does provide a certain “regalness”, and despite my personal preferences around these types of things, minor aspects relating to appearance aren’t overly bothersome to me one way or the other. Overall? I think it looks great. The back cover is made of the stiffest card stock you’ll find, and though you could say is perhaps overdone, is indicative of the overall quality in the notepad itself. Further branding, other details, and the made in Japan stamp appear across the top on the front cover overlap. The pages themselves are glue bound at the top, with the cover opening up and away from the binding. There are no pre-folds or breaks for specifically folding back the cover (a la Rhodia notepads), however if you were a little pushed for space the cover will fold back easily. The only caveat here is the blotting sheet may come adrift if that is also folded back, effectively being attached as the first sheet of the notepad. When used on my desk at home I generally prefer to leave the cover open above the page. 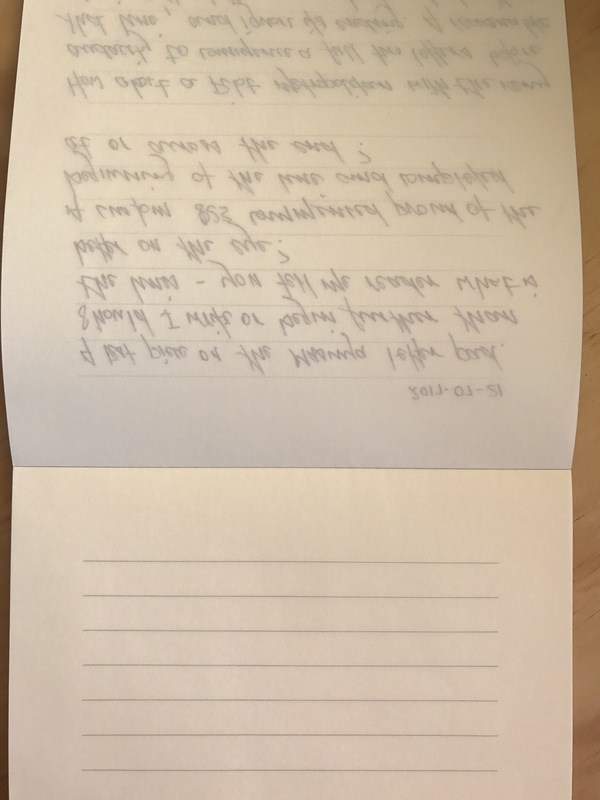 As I’ve mentioned above, the front of the notepad contains a stiffened sheet providing a blotting paper between the actual cover and first written page. I can attest to the nature of the paper under light, given most of my writing is done very early in the morning under a small LED white lamp, and with many other paper types there is occasionally some readjusting of position due to glare — not so the Yuga Letter Pad. It indeed provides a very soft return to any light source. 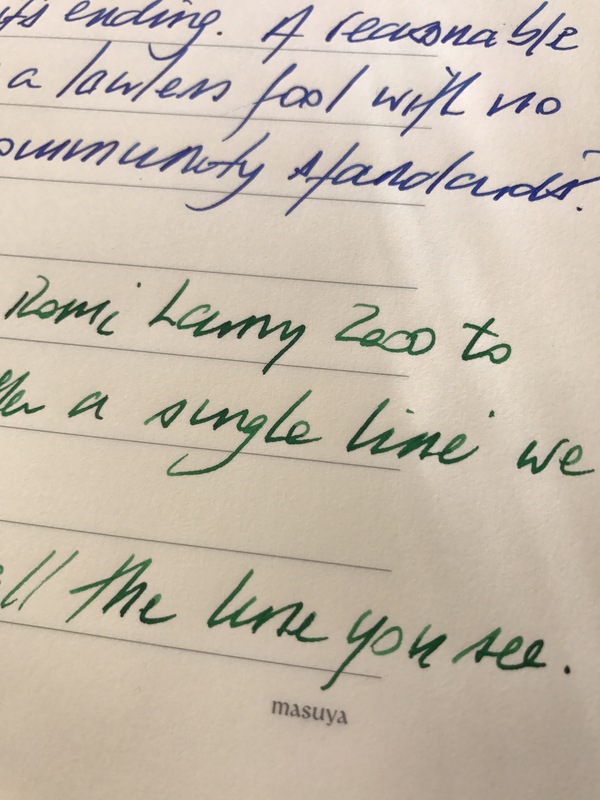 My concerns over the line spacing mentioned earlier in the post were ill-founded, with the 12mm distance looking a lot broader on a blank page than a written one. I recall having similar thoughts before laying ink down in the Monokaki Notebook as well. Despite my best intentions, at times, a few pages into a letter my handwriting can become a little — shall we say — unwieldy, and I believe this measure of spacing facilitates a certain amount of readability for the recipient. As with many paper types, the lines themselves fade into the background once the page is filled with words. A little more on this in Writing Performance below. I’ve estimated previously the Masuya paper is around the 60 gsm mark, and have yet to find anything confirming this. Based on the known weights of other paper and Tomoe River at 52 gsm, as a ballpark figure that is certainly what it feels like, hopefully providing you with some idea of the lightweight nature of Masuya paper. A little background on the origins of this paper, including how it was ”made for writers” can be found in the product details on the Bookbinders website. After uncapping a fountain pen and writing those first few strokes, any concerns I had about whether the paper would be Monokaki notebook-like melted away immediately. It’s as good as it should be. As good as I expected. Why I had doubts in the first place I’m not sure – its Masuya paper after all. In the end, my biggest challenge (if you could call it that) came in determining whether to overwrite each end of the pre-printed soft grey lines, given there is an invisible margin around the border where the line ruling stops more than 20mm from each end (okay, so I did measure it — 23mm if you must know). Each to their own here, however to close out this thought, I decided on about a 10mm left margin and will essentially write completely to the right hand end of the page. Look, really, the paper is exactly as I found it in the notebook — much to my overwhelming joy! I’ve written about it before, it remains my favourite, so I will keep things brief. Light weight paper, smooth without the slip, handles pretty much every ink and nib, a little show through yet no bleed or feathering. Of course the difference here being the show through may or may not be an issue depending on whether you prefer to write on both sides of the paper. Although seen through the page, there are no printed lines on the reverse of each sheet, so it appears the manufacturer has a certain view on their preferred approach here. My personal approach has always been to write on both sides of notebook pages regardless of show through, however with correspondence I generally do not. 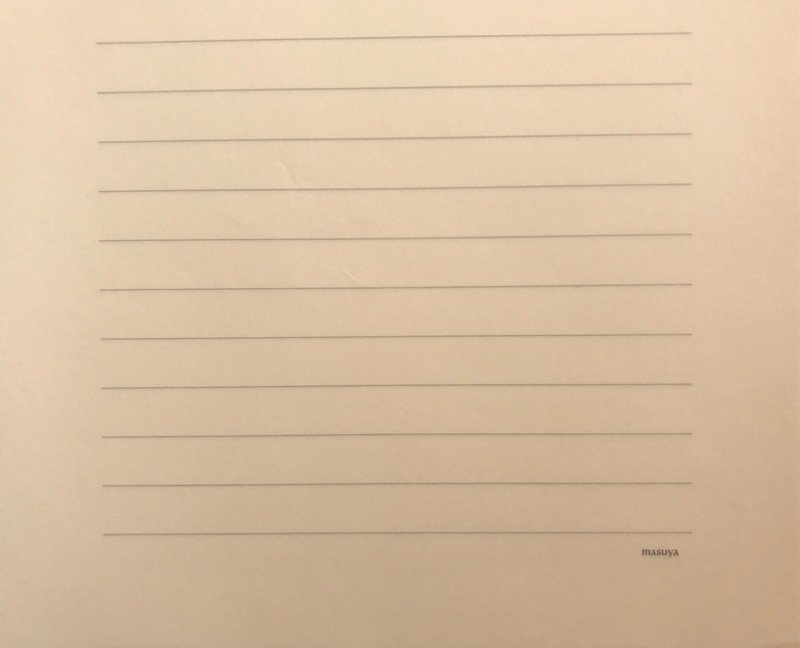 On the subject of the Yuga Letter Pad, this approach takes care of any show-through aversion you may have — just not perhaps the cost per sheet. Exactly how relevant that might be is a decision for you to make (further on this below). A quick word on the concerns about line spacing I mentioned above. At 12mm spacing and 18 lines per page, the calculation to compare it with the 6mm, 34 lines per page Daiso Report Pad is fairly simple. Particularly when I tell you with the smaller spacing I only use every second line — rendering things near identical on this point. Now is also a good time to take this comparison a little further. So how does it compare with the $2.80 Daiso B5 Complete Report Pad I have previously been using for correspondence for some time now? Based on price, the difference here is a significant order of magnitude to say the least. With Daiso’s Report Pad containing 100 sheets at a $2.80 price point ($0.028 per sheet), something like the Yuga is never going to come close at $19.90 for 50 sheets ($0.40 per sheet). Now having done exactly that, I will say comparing them in such a way probably misses the point a little. So, in relation to the subject notepad in this post, I know what I’m willing to pay, however would certainly never assume to know what you, or anyone else should be willing to pay. 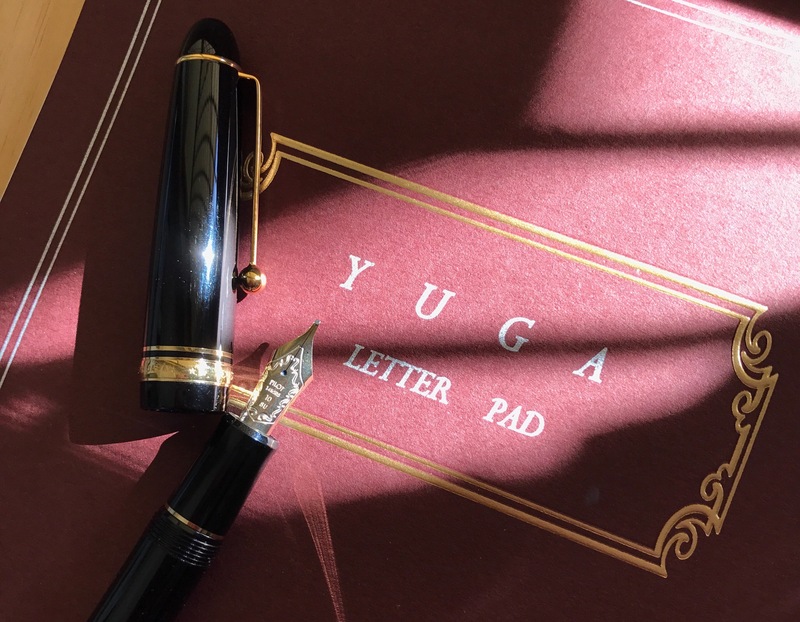 So by comparison, is the Yuga Letter Pad a significantly better experience? Can that be quantified and applied to another user’s perspective? Perhaps, however quite a number of personal preferences and other factors would require accounting for with such an endeavour. Then of course there is the far simpler: just go ahead and treat yourself approach. Certainly one I’ve been known to follow quite successfully. Far easier to do with a $20.00 notepad than a $200.00 pen of course (though admittedly — even easier with a $2.80 notepad…). 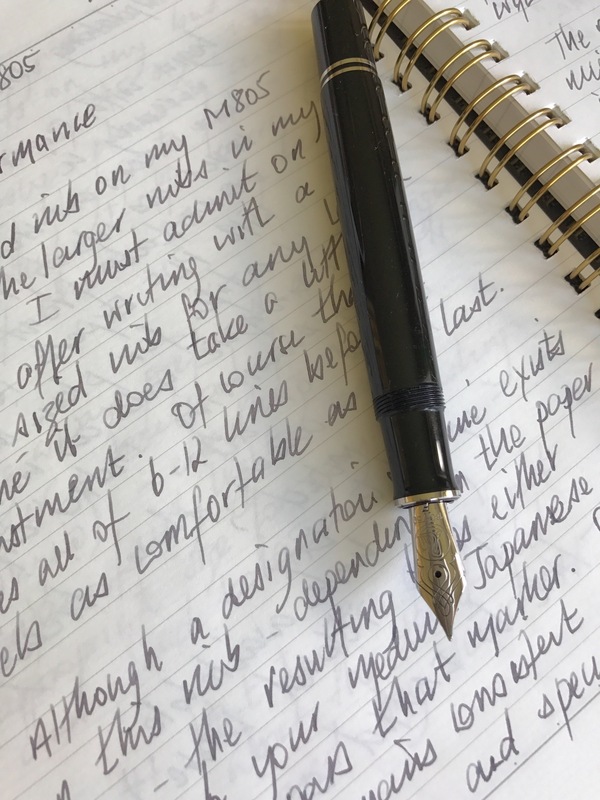 Having written about the more than capable and far cheaper Daiso Report Pad in a previous post, I still admire its ability for letter writing with a fountain pen at such a low price point. Of course in a blind side by side “what’s best” comparison, you’d pick the more expensive Yuga Letter Pad in an instant, however as I’ve alluded to above, that’s not the entire story. 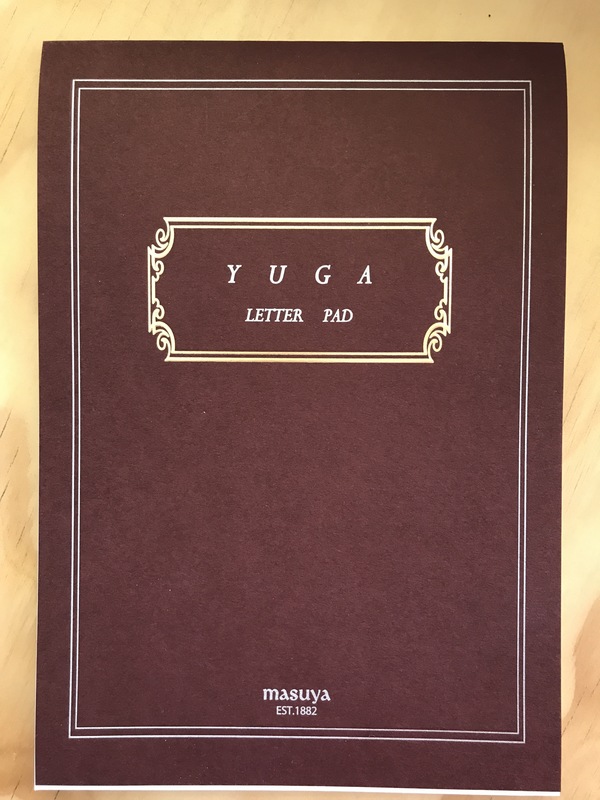 Yes, the Yuga Letter Pad is definitely worth the money in my humble opinion, however at the end of the day, future letter-writing me will probably use both… or something else. After all, there will be plenty of correspondence written in the years to come, and no doubt I’ll test out plenty of other paper during that time as well. So to conclude things here and perhaps confound this entire section just a little: Masuya paper is my favourite paper — simple as that. As for the overall use case of note paper like this — you can probably take its title in the most literal sense. This will sit on my desk, be intermittently filled with words and sent to those good friends who receive letters from me from time to time. I don’t think I’m really going to provide any novel suggestions here — nor do you need any. It’s a letter writing pad, and is perfectly suited to precisely that task. Whereas something like a Rhodia No. 16 notepad may suit equally well for general note taking, testing your new inks or more formal written correspondence, the Yuga Letter Pad appears to have a somewhat more defined role. Of course you could use it for anything you like. I mean let’s face it — pages torn from a spiral notebook will just as easily carry your words across the globe in an envelope. My intention here is to simply point out (again considering price point), you would not likely pick up the Yuga for scribbling down some random notes and a phone number. It will, however be more than capable for whatever you do throw at it. Having now arrived at this point of the post, I must invariably give you some final thoughts. Interestingly, the further I progressed through the post, I became increasingly unsure of what those might be. Uncertainty not through any reservation about the paper or letter pad itself — nor the price for that matter. Which in the end I think is precisely the point. With so many options at just about every price point available these days, there really is no single answer. A post such as this will only ever end with the same recommendation: I love this paper, go buy it! So many choices, yet seemingly no choice all at the same time — that is, you simply have to go and buy some yourself, otherwise you’ll be missing out. That, of course, is not really the case at all is it? The other little voice in my ear? The cost benefit analysis when compared with cheaper paper as I’ve discussed above. If you are a Tomoe River paper buyer, you won’t bat an eyelid. If Rhodia is a stretch — then the price may give you momentary pause. Any further assumptions on my part here would be a fool’s errand. 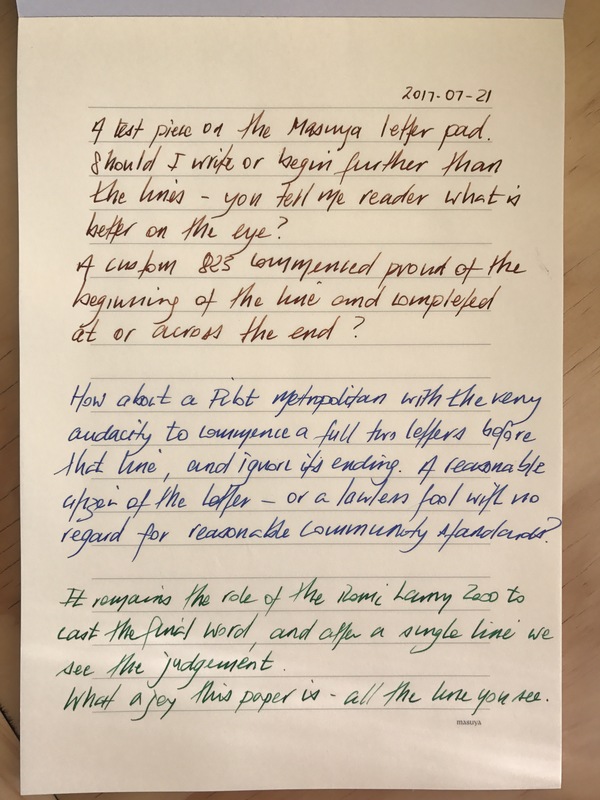 If you do choose to buy some, wield a fountain pen with any great regularity, and correspond with others who do the same, send a few blank sheets with your next letter. I’m sure the recipient will thank you. In closing, I will say the Yuga Letter Pad is a high quality, well designed and constructed correspondence notepad with wonderful paper (did I mention it’s my favourite?) for the fountain pen user. Although not a budget option, in my opinion belies its price point ever so slightly — and for me at least — that’s value. Although I’ve posted an image to Instagram from yesterday’s visit to the Bookbinders store on Brisbane’s Northside, readers of the blog and my social media following are not one and the same, so I thought I’d share a couple of things in a brief post. It was my second visit to the actual store itself — such a wonderful, calming space amid the chaos of rainy Friday afternoon traffic. The Bookbinders team do a fantastic job, stocking great products and provide outstanding customer service. It was great to hear business is strong, with foot traffic continuing to increase at the store itself. It is definitely worth a visit if you have yet to do so, and of course if you already have, you don’t need me to encourage you to return — I’m sure that is inevitable. Though it wasn’t a big haul by any stretch, the few key items on my list were ticked off. 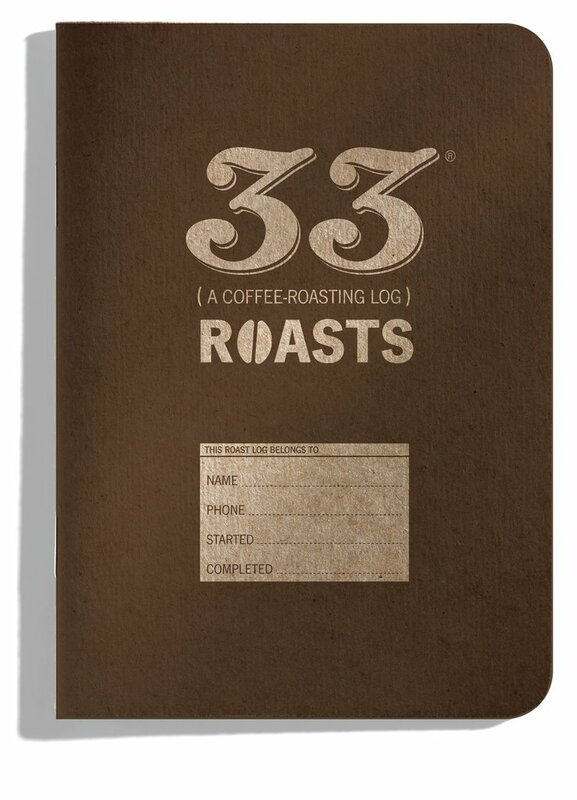 I’ve written in a recent post about my thoughts and plans for recording my coffee roasting data, and the main reason for the visit was to pick up the new 33 Roasts log from the 33 Books series. My only concern (immediately alleviated upon closer inspection) was whether the log contained units in degrees celsius as well as Fahrenheit (being a US publication). All good to go here, with units in celsius appearing on the R hand axis of the roast graph. 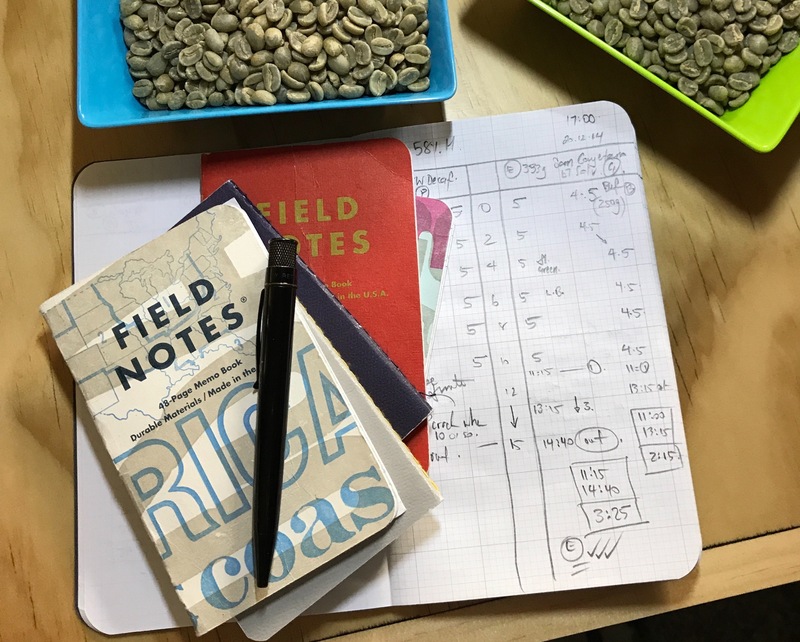 Key details from each of my roasts will end up in a spreadsheet, and the entire notebook contents scanned, indexed and saved for safe keeping and easy search (perhaps a post for another day). My coffee drinking habits? Well why not 33 Log those as well? When out, I use a modified version of this Day One / Launch Center Pro template (also available as Workflow app action if that is your preference) to rate the beverages cafes serve me, however when at home I’d like to record a little more often in relation to drinking what I’ve roasted myself. The 33 Cups of Coffee log seems like a good way to go here. Upon completion, these will also be scanned, and I’m thinking perhaps the 4 and 5 star rated cups are worthy of indexing for future reference. I’ll give that one a little more thought. One of the most pleasing aspects of visiting the store was seeing the healthy stock of Monokaki notebooks, which still remain my all-time favourite. Previous posts about those? Yes — here and here if you are interested. Having passed my 50% rule (that is, of usage in my current notebook before searching for another), it wasn’t a hard choice as to what I’d pick up next. The masuya paper contained therein is a perfect mash-up of Tomoe River-like weight with a little more tooth to the nib. Just the way I like it. In order to share my fondness, some of that very paper will also be going out in handwritten correspondence from the Yuga Letter Pad I picked up as well. Given this was never intended to be a lengthy post, in closing, I think we are very lucky to have the Bookbinders team not only based in Brisbane, but having a brick and mortar presence as well. They are wonderful people with a passion for the industry — something well worth supporting as a consumer. Happy writing, roasting and drinking. An interest in fountain pens inherently carries with it a similar level of attention to paper. Although I’ve written about some budget friendly notebook options on one or two occasions, I’m not averse to paying a little more for them either. One such notebook — while not prohibitive in cost — is the L!fe Symphony N93 Spiral Bound A5 currently sitting on my desk. 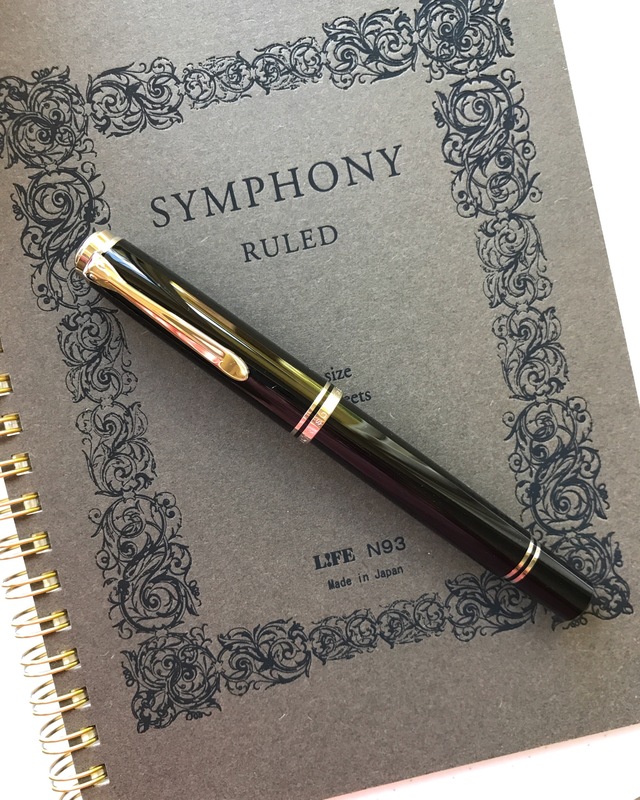 For the remainder of this post, I will mostly use Life rather than L!fe, as I do find it a little distracting, and an online search term of Life Symphony Notebook will bring up what you are looking for. In summary, I’d say the Symphony notebook has no bells and minimal whistles — just high quality design, construction and performance. 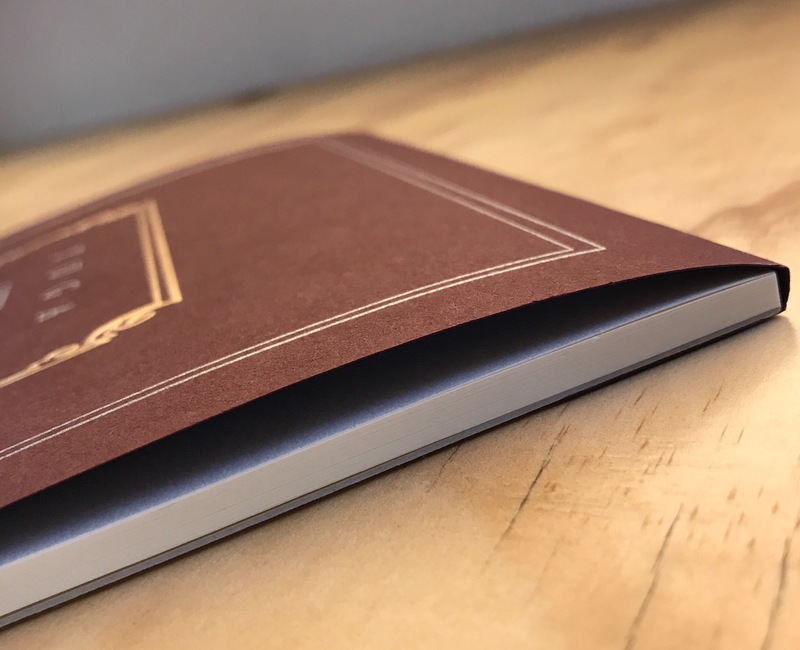 Though technically a soft cover notebook, the Symphony carries very thick, stiffened card stock front and back which is about as hard as you’d find in a soft-cover notebook. As the images in this post show, I purchased what is described on various retail sites as the “grey” version. The front cover features some intricate detailing reminiscent of a dense vine, and is quite attractive to my eye. The back cover matches in colour, however is unadorned with any detailing or labelling. To be honest I’m not sure how I’d describe this colour. At the time of purchase, I was drawn to the contrast between the prominent brass coloured double spiral binding and the deeper, slightly more mysterious looking cover. Something enigmatic to provide a little mystery, and shroud what would ultimately be a collection of fairly superficial writing you might say. Speaking of the binding, those brassy double spirals follow the lead of the cover, in that they are very stiff, providing a solid backbone to the book in a way befitting the overall quality throughout. There is a little wiggle room or “play” in the pages, however I’ve not noticed this when writing, and believe me I would, for it is a pet peeve of mine with spiral bound notebooks. Referring back to the “no bells” statement above — rather than a criticism, is more a reference to a design which appears focused on the essential requirements, and doing them exceedingly well. There are no pockets, bookmark ribbons, elastic enclosures or pre-formatting on the paper other than the 8mm ruling in subtle grey. I do tend to use ribbon markers if they are in a notebook, however equally don’t mind if they aren’t — avoiding the need to get them out of the way once the notebook is open to write. Pre-formatted page numbering and perhaps a date field? Again, generally used when present, though inconsequential if not. Plain, grid or ruled? Personal preference, for which I’ll take ruled nine times out of ten these days. Looking around online, you’ll find A5, B5 and A4 variations, available in grey, red, and blue covers. I was unable to find a specific gsm weight rating, however the paper feels very similar to your usual Clairefontaine/Rhodia type weighting. Searching around reveals 8mm ruled, 5mm grid, and plain paper variations, however I am not sure how widely available these options are. Of course most of the notebooks you see on these pages from time to time are great for writing, and whether they reach the “just about perfect” status is really a matter of personal preference isn’t it. I’ve written ad nauseam about my preference for a little feedback on the page, rather than skating about one a little too slick. No surprises the same thoughts will be applied here. As I write this, I am 130 pages in of the 200 available to me in this notebook, and I’ve certainly no intention of not continuing right through to the last. Whether running a finger down the page or forming letters along a line — the paper is quite smooth. Not Clairefontaine notebook smooth (a skater for me) by any stretch, and not quite Rhodia smooth either — however probably not far behind. Therefore, on the feedback/tooth scale I’d say it sits squarely in the upper end of my preferred window. Currently in my hand is a Pilot Custom Heritage 92 (FM nib), containing Bookbinders Snake Ink Red Belly Black. On cheaper, softer paper, the CH 92 will occasionally want to “dig in” a little, however that is certainly not the case here. Both the sensory and auditory feedback (on a quiet pre-dawn morning), are pleasing to say the least. I’d be happy enough if restricted to this paper for the rest of my writing days. 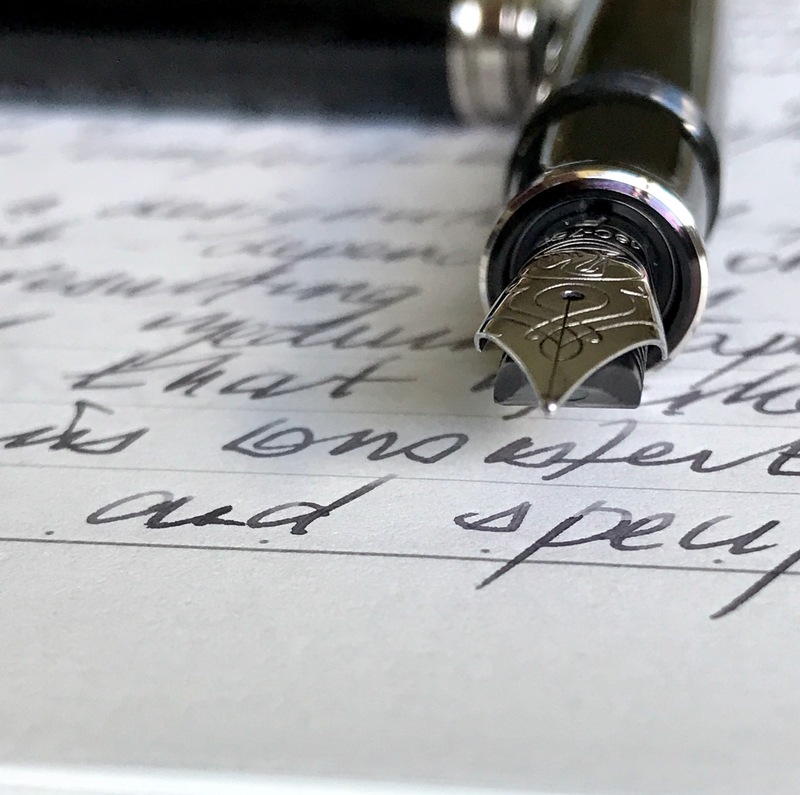 Using a stiffer nib, such as my medium Platinum President, I find more of that “skating across the top” feel, highlighting the nib and paper interaction, which influences the perception of all our writing experiences. Add to that the usual differences in writing on the left hand page atop the stack of 65 or so filled sheets versus the harder, compressed, yet to be written sheets on the right. Whatever your particular preference or thoughts here — this is great paper for fountain pens. Feathering, show through, or bleed are nowhere to be found, and I feel you’d have to use a very broad nib containing extremely saturated, very wet ink to change that to any great degree. You will be safe with most general writing pens. Dry time is commensurate with my Rhodia notepads, or a perhaps a touch faster with certain inks. At this point I am probably meant to test and demonstrate numerous different pen types to illustrate how this paper handles them all (and I am thankful to those who do), however looking back through those 130 pages, I can find all of about three with non-fountain pen markings (Retro 51/Schmidt rollerball from a Baron Fig Squire out of interest). As you’d expect, handled with aplomb by the paper. In a notebook bought on the basis of being great for fountain pens, that can hardly come as a surprise, and call this a “review” if you like, however this post is written merely as a reflection on how I’ve found using rather than “testing” — the Symphony notebook over the past few months. One of the more common uses for my notebooks is to carry them on my lunch break, perch on a stool at the bar of my favourite cafe, and do some writing. Having purchased the Symphony notebook with this activity in mind, I soon found its suitability for the task was not quite spot on. The notebook itself is fantastic of course, however given its thickness, something as simple as the size of the spirals prevents it sitting nice and flat against my iPad Air 2 when carried together. A big deal? Hardly – though why bother when I don’t have to, particularly when there is plenty of flatness in say, the Baron Fig Vanguard of similar size (not thickness) which is currently fulfilling lunch break longhand duties. Beyond such silly personal eccentricities, the Life Symphony No. 93 is what I’d consider a perfect desk book, where weight, thickness and spiral size matter less. It’s perfect for long form writing, with the A5 size constraining my hand, which at times can become a little unwieldy and careless on a larger sized page. Brief notes or meeting minutes – all perfect as well, however to me, a notebook like this begs for something a little grander. Perhaps some poetry, elegant prose, or even a your next novel. In rounding things out here, I’d have to say from a construction and aesthetic perspective, the Symphony is more than well equipped to handle just about anything you could throw at it. Perhaps you’d see some wear and tear from repetitive backpack in/out cycles, though I think it would stand up pretty well. I’m certainly enjoying the quality of both overall construction and paper of this Symphony notebook from Life Stationery. It’s traditional without being staid; functional yet solid; and clean without feeling underdone or sparse. While it doesn’t suit my particular style of carry, it makes a fantastic desk notebook, and if you are someone who always uses a bag, my concerns are a moot point. Whether a notebook like this represents value for money really comes down to how you personally value quality of construction and overall aesthetics. It is a notebook I consider represents excellent value for money, and would certainly buy one again – for my desk of course. Image courtesy 33 Books Co. Though I’ve yet to get my hands on one directly, this bite from Sprudge recently caught my eye. The folk at 33 Books Co in Portland, Oregon, have just released a coffee roasting log: 33 Roasts, which looks just about perfect for an enthusiastic home roaster. 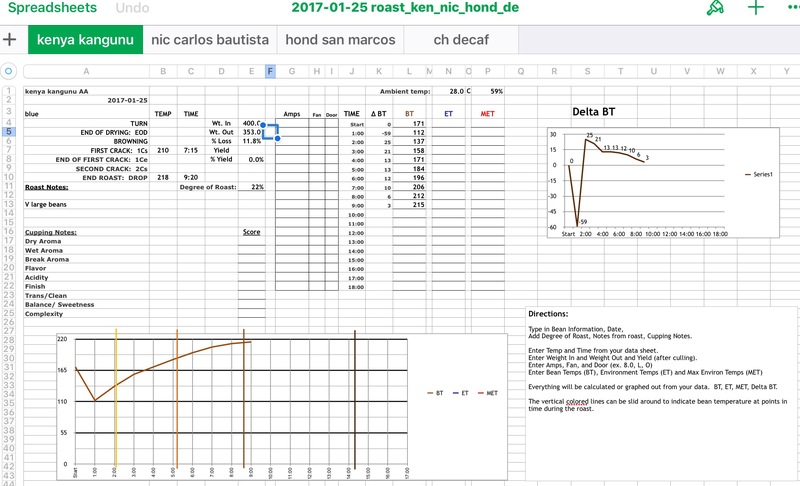 Reading about this new offering triggered a few thoughts on how I’ve recorded my home roasting data in the past, and how I might continue from here. While there are many ways to record data when roasting your own green coffee, I’ve generally found analogue systems well suited to my needs, having tried digital methods on and off over the four years I’ve been roasting at home. If I could suggest one thing to someone considering having a go at home roasting, it is to record data somehow. The exact means is not important, however as trends emerge and you look to make adjustments, having something to refer back to is fairly valuable. So how do I do it? The most obvious means of doing so given my fondness for all things analogue, is a notebook and pen. In the absence of setting up some form of more automated temperature logging and roasting software (the probe, thermocouple and roasting software based “HeatSnob” from Coffee Snobs for example), I have always relied on taking down data points manually (time, temperature and heat settings) — irrespective of whether these end up in something digital or remain on paper. After keeping things in Evernote for a short while, I ended up simply taking the relevant notes down in a pocket-sized Field Notes notebook, and have many filled to the brim with roasting records now safely stored in a shoe box. In recent months I’ve been using an infrared thermometer gun 1 to capture temperature readings, and manually entering the data on a per minute basis into a spreadsheet template I stumbled across online via the Home Barista Forum. The advantage of course being the roasting curves produced automatically as the data is entered, however I generally don’t have a look at these until the end of the roast, simply following the rate of rise by looking at the temperature change down the column as the roast progresses (also calculated automatically as I enter the raw temperature readings). I have enjoyed using this method, as I can see a visual curve of how the roast progressed, though at times it can become a little tiresome to manually capture and log the temperature readings every minute or so. Again, with dedicated, connected temperature probes this would be a breeze, however that might be a project for another time. Why the move back to analogue then? Well, the obvious why not? aside – even when using a spreadsheet, my notebook is always on hand, as I find in the heat of the moment around first crack, it is easier to keep an eye on things and scrawl down the time and temperature data by hand rather than worrying about entering data onto the spreadsheet. Given things can happen fairly quickly at that point in the roast, I usually fill in the blanks on the spreadsheet once the beans are out and cooling. There are some apparent disadvantages to an analogue system in terms of search, and viewing or manipulating data, however remember we are not talking about a professional, commercial-scale roasting operation here (very far from it actually). Most times in the past I’ve flagged the great roasts and referred back to my previous records be they digital or analogue fairly easily anyway. Having recently begun creating a digital index of my analogue archives (irony not lost), I plan to get around to my roasting logs and do the same. Of course keeping on top of things like this as I go would be a much better idea. You might be surprised how easily things are found with a decently constructed and searchable index. Then again perhaps you might not, for I guess it is common sense really isn’t it. Finally, there is a simplistic ease in opening a notebook and recording data, without setting up my iPad, opening Numbers, selecting a spreadsheet template, creating a new file, copying some tabs and then entering some preliminary information. Sure, analogue isn’t for everyone, however after using a few different systems (both digital and analogue) over the past four years, I’ve come to know what I like, what I need, and what works best for me. Analogue is well… analogue. Why the need for a pre-formatted option such as this latest offering from the 33 Books company? 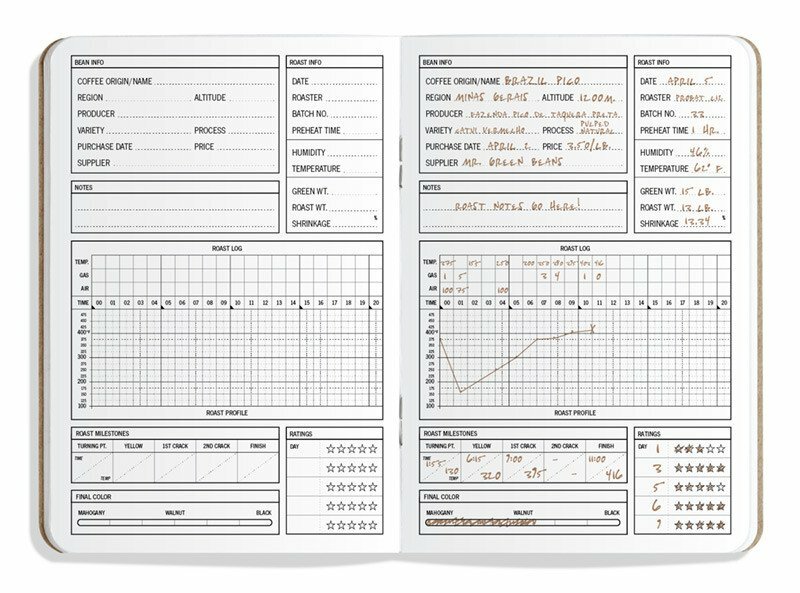 For one, I think they look fantastic, and the pre-formatted pages contain just about every field you might need (particularly as a home roaster), along with a notes field for any little extras. A graph to plot those data points on a curve? There as well. Add to that a ratings field for retrospectively adding tasting notes over subsequent days or weeks is also a nice touch. A teeny, tiny amount of real freshly-roasted coffee is added to the ink in each new edition, which is cryptically noted on the back. At 5×7 inches — or what I’d call just the right size, the log is similar to my current general note-taker in the Baron Fig Vanguard, or the new upsized Pitch Black Field Notes offering. Incidentally, one my favourite roasting logs in the past was the Field Notes Arts & Sciences edition, which came in at this same slightly larger-than-pocket size. In noting down these thoughts on my coffee roasting logs, of course I’ve yet to get my hands on one of those beauties from 33 Books Co., however the fine folk at Bookbinders are on the case and will come through with the goods pretty soon – of that I’m certain. 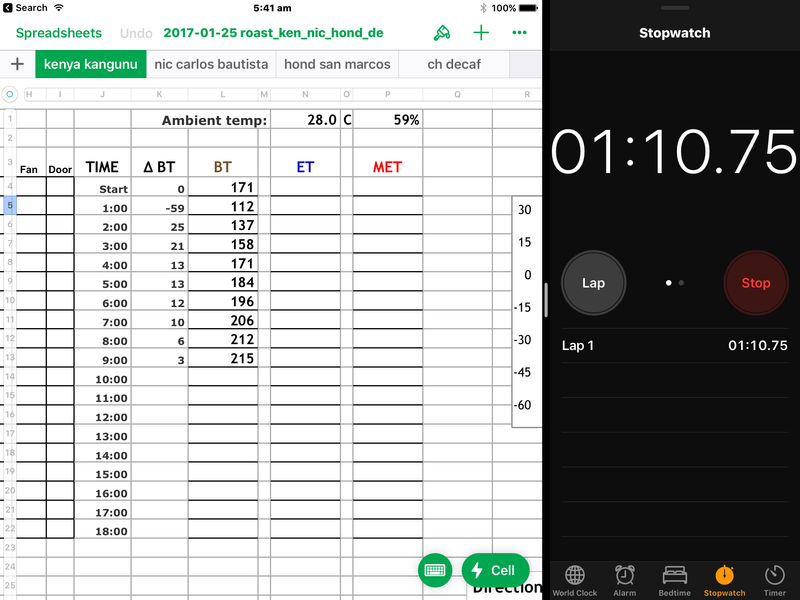 Having just taken delivery of a new coffee roaster (another post for another time), what better time to start afresh with my data logging process – and for that, the 33 Roast Log seems pretty much spot on. You might say this Pelikan M805 comes directly from the executive collection, a description perhaps befitting its appearance. Although I wouldn’t necessarily disagree — for myself at least — that description is perhaps a little misleading when it comes to the true nature of the pen. On that score, I’d consider it a smooth, comfortable cruiser, rather than simply a boardroom status symbol. A pleasant long form writer more so than a one signature wonder. The Pelikan M805: great 18k F nib on a great pen. 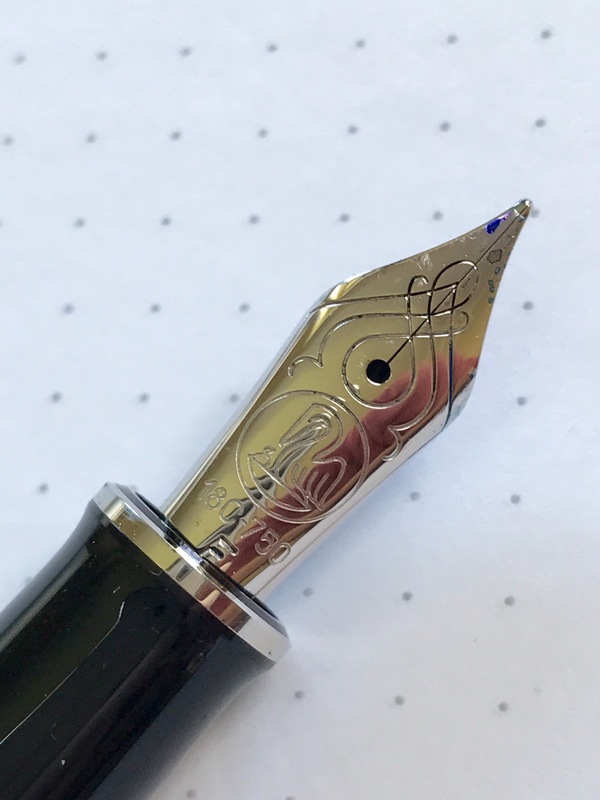 This black and rhodium M805 (18k fine nib) was kindly and very generously passed on to me by a fellow enthusiast downsizing his collection. It is a pen quite frequently inked and often called upon for writing duties, ending page six as comfortably in the hand as it commenced page one. As you can see in the accompanying images, the outward appearance of this pen can be described as standard executive-looking black. I do own a number of black pens, and of those, the rhodium trimmed are my favourites. It is a colour scheme I never really tire of. Classic, timeless, and yes — perhaps boring for some. Be that as it may, however you might choose to describe that look yourself — I love it. The members of the M800/805 series from Pelikan are sizeable pens (though a step down from the 1000’s), and setting off on this post also triggered a few thoughts on whether I have a preferred size in relation to my pens in general. That post morphed into something a little different, however as far as sizes are concerned, I would note the 805 — though at the upper limit — remains firmly in my preferred zone. For reference, my M600 is probably right in the centre, as is the Sailor 1911 Large. I’ve found it interesting how my cap-posting preferences have changed over time, and I put it down to the fact some of my favourite writing pens are from the larger end of my collection, thus requiring the caps be posted on many of the smaller to retain a semblance of this new-found “balance” I’ve become accustomed to. Here of course I make reference within my collection, for there are certainly many larger and more weighty pens on the market which aren’t sitting in my drawer waiting for ink. As you can imagine, I use this particular pen without posting the cap. Being a pen which prefers a medium to large hand, posting might of course suit a small few, however I’d expect those to be at the far right of the bell curve on that one. Overall it is a very well-balanced pen (when not posted), and the main difference for me compared with the M600 is the diameter at the point my index finger sits on the section. The 805 being that little bit larger here, separates my thumb and index finger just a little further then the 600, and as a result I find it not quite as comfortable as some of my pens with slightly narrower sections (again the 1911 Large comes to mind – though similar in diameter, probably suits a little better given the shape of its taper relative to the barrel). As with all Pelikan pens, the finish is on point, and although the images do a far better job than my words, there are a couple of things which do come to mind when considering what I enjoy most about its appearance. In addition to the black and rhodium combination I’ve mentioned already — I’d say the overall balance between the finial/clip ring, cap/branding ring, and those around the piston knob when the pen is capped. The typical Pelikan beak-shaped clip, and finial logo complement things nicely, and although there is a slight taper towards either end, the flat ends exhibited by Pelikan pens I find neat and definitive. When uncapped, the 18k nib stands impressively, with engraved detailing, Pelikan logo, and nib designation lettering. The nib itself is a step up in size from the M600, commensurate with the overall size of the pen. A gentle taper at the section and unobtrusive cap threads round things out nicely. Overall, a classically styled, yet sharp and well-appointed pen which looks out-of-place nowhere really — perhaps with the exception of a dusty work shed or rolling around loose in the bottom of a gym bag. Depending on where you might pick one up, pricing is approximately AU$600.00 – $795.00 (RRP: AU$795.00) at the time of writing. The 18k gold nib on the M805 is one of the larger nibs in my collection. I must admit on occasion, after writing with a smaller nib for any length of time, it does take a little time to adjust. Of course after a few lines it feels as comfortable as any from my pen drawer. Though it carries the Fine designation, depending on paper type, the resulting line width approaches your Japanese Medium or even beyond. Of course that is nothing unexpected, and remains consistent with most other European nibs, and certainly those on my other Pelikans. Despite the quality finish and stylish appearance, the not insignificant price point carries with it a certain expectation in terms of performance, and having always found Pelikan to deliver as promised — I’d have to say this time is no different. As I’ve touched on already, though sizeable, the nib is well-balanced given the overall size of the pen. 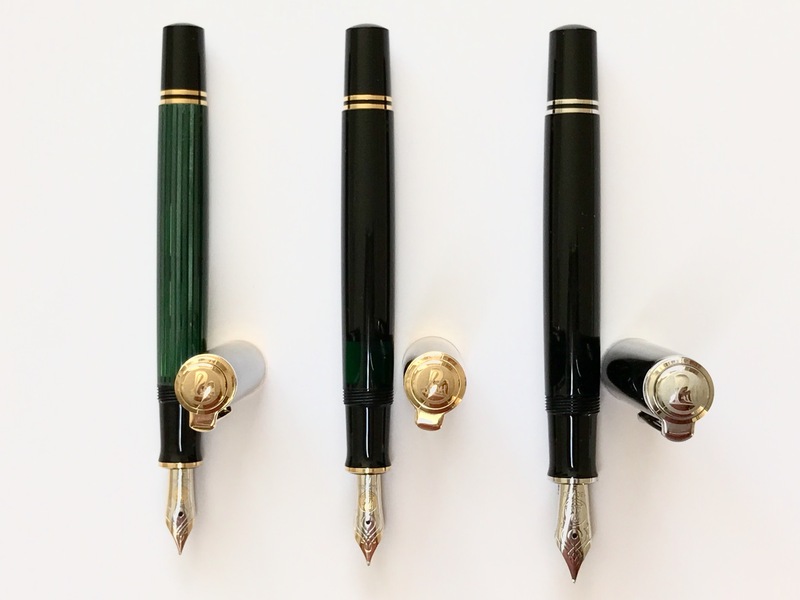 Depending on the size of your hand and preference (one of course influencing the other to a large extent), the large nib/full-sized pen may be a combination slightly outside your comfort level for lengthy writing. I’d say my hands are average, and as I’ve mentioned, it probably sits at the upper end of my “comfort range”. The 18k gold nib is perhaps not as soft in the “give” side of things as some of my other pens, however I don’t consider that a negative as such. Although firm, it is an effortless glider with just the right footprint on the page to carry a dense, vibrant line — the magnitude of which will of course relate to the particular ink you have filled at the time. Some of my other gold nibs (particularly the 14k fine and extra fine in my M600 and M400’s respectively; or say, the Sailor Sapporo 14k), tend to give a little more and “sit in” to the page, which I find just as comfortable really — again depending on the type of paper you are using. Ultimately, the overall balance, size, and nib combine perfectly to produce the effortless feel this pen provides when I write with it. Probably the most pertinent aspects about this pen are its size and performance. Yes, I find the build and design of high quality — and typical of the Pelikan pens I own — however what makes this any different to those other pens? Were it larger either in diameter or length, the pen would most likely see less use, which is of course a matter of personal preference. Were I looking to buy another, the Pelikan 600 series probably would be the point I’d be considering — offering just a marginally better size fit, and of course saving a little money (depending on the particular model) to boot. As far as writing is concerned, this pen is simply a beauty. Sometimes I feel it might be more systematic to have some sort of rating system for these posts, however most of them are approached with a couple of points in mind. Anything not discussed you can assume is relatively unimportant to me in the grand scheme of things (for example piston vs converter, or ink capacity to name a couple). Generally each post can be summed up before I begin, by thinking what I might say if asked for a quick summary about the pen in question. It’s probably one of the largest I’d comfortably use, however it’s a very high quality pen with a great nib, and is an absolute joy to write with.